Today was perfect for a lazy brunch day. The husband and I went to see Demetri Martin perform at the local theater last night and missed our usual bedtime (10pm). Couple that with the fact that we lost an hour for Daylight Savings Time and I knew staying on the couch for most of the morning followed by a filling meal was in order. Plus, I was excited to make baked eggs for the first time which I’ve been meaning to do since I saw this delectable photo from Shoot to Cook and began drooling. 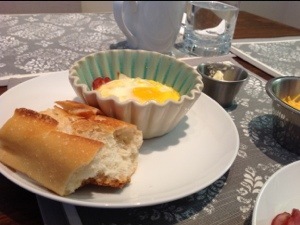 I think I first fell in love with baked eggs when I was living in Brooklyn and visiting Fabiane’s on the regular. My love blossomed from there but I never thought of making them myself – they seemed too decadent and special to replicate! Alas, it is actually super easy. Don’t tell! I made mine with different combinations of turkey bacon, cheddar cheese, asparagus (we had leftover from dinner) and onions. The husband doesn’t like a gooey yolk so I made his “scrambled” baked eggs. I like mine a bit runnier (better! hellooo!) so I can dip my bread in. All in all they actually turned out pretty well. 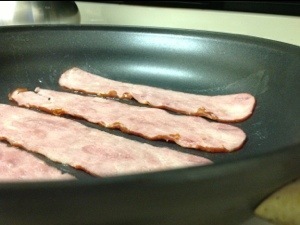 I started out by browning some turkey bacon in a pan. 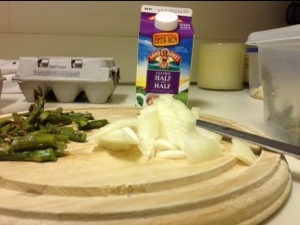 I chopped up my fillings to get them ready for the fun part – the food assembly. 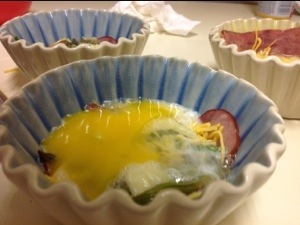 After separating the whites and the yolks (and adding a bit of half and half to the whites) I assembled my creations. 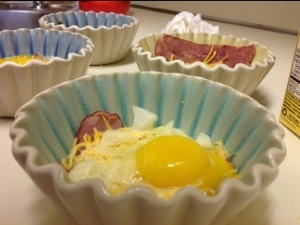 The only round individual ramekins I own are packed away with the holiday stuff, so I used what I had on hand. I fell in love with these adorable individual pie bakers at Anthropologie a few months ago when I found them in the sale bin and snatched up 12. They worked well enough! Note the crumpled up paper towel in the background. Part of the photograph’s aesthetic and definitely intentionally placed. My second yolk just wouldn’t cooperate. I gave it two tries but they kept breaking! I decided not to be too wasteful and poured some in. Not the beautiful, round, perfect, sun-looking yolk I was hoping for but I’ll admit that it tasted just as good. Throw some carbs on the plate and I’m a happy girl.